Before I left for my vacation, a friend of mine recommended a very good and trustworthy tour operator, Electa Travels, so we called them for informations about services and prices. I already got a hint about the professionalism of this tour company when I called them the first time to know what kind of day tours they had to offer for Italy, and in particular for Genoa and the surrounding areas: they answered to all my questions and gave me a lot of options to choose from, so then we booked a shore excursion in Genoa and the nearby Cinque Terre, a 100% customazible day tour, perfect for our needs. When we got to Genoa, our private driver was already there waiting for us. After a short drive to the entrance of the Centro storico, we parked the car and started walking through the small streets of the oldest part of this wonderful town. This part of Genoa is one of the largest medieval downtown in Europe, it develops in a tangled maze of alleys that unexpectedly open into small plazas, you can see street vendors selling their goods, coffee shops, bar, with their tables out and people strolling. A step back in time! Of course, we had to stop by one of the bakeries and have a piece of the typical focaccia, a soft warm flatbread. After visiting the magnificent Cattedrale di San Lorenzo we headed to visit the Cristoforo Colombus’ family house. On our way there, we passed Piazza Dante and the two towers, Torri di Porta Soprana, that were, at the medieval time, one of the entrances to the city. While I was visiting Cristoforo Columbus’ house the driver went to pick up the car from where it was parked. Too bad we were running out of time, because we wanted to visit also the Acquarium of Genoa, one of the biggest in Europe. Cinque Terre it’s a portion of the coast in the nearby of Genoa, exactly in the territory of the smaller city of La Spezia, here you can find five small, (but still incredibly beautiful) villages: Monterosso al Mare, Vernazza, Corniglia, Manarola and Riomaggiore, characterized by colourful buildings and terraces built on the steep territory on the coast, just by the seaside. 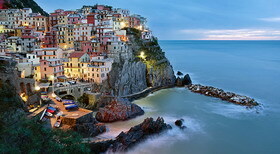 This area is part of the Cinque Terre National Park and also known as a World Heritage Site by Unesco. On our way back to Genoa, we also visited Rapallo and then we had a wonderful dinner in Portofino, one of the fanciest and coolest area in the riviera. We were totally happy and satisfied of our day tour in Genoa and surrounding areas, and that speciale Cinque Terre tour will always have a place in my heart. Thanks to Electa Travels we were able to enjoy the best of this city with a short but complete day tour of the area: we can only recommend you this tour operator that works with great professionalism to provide you the best shore excursions and day tours in Italy, France and Spain.